Dewalt DCH273P2 features a powerful brushless motor that guarantees more runtime and long-term use. The tool is battery-powered, and it comes with two sets of Max batteries (5.0Ah). The tool is designed for utmost comfort and power. There is an active counter vibration which makes it easy to use the machine. The amount of energy given by this rotary hammer drill is about 2.1 joules. The equipment comes with a utility hook which makes it easy for the user to hang and store the rotary hammer drill after use. For every handyman who wants a multipurpose and powerful hammer drill in their toolboxes, this is the equipment to procure. This Dewalt cordless rotary hammer drill review looks at the tool in detail to help you understand it better. Q: I drill using a Bosch hammer drill on concrete, 20″ thick. Will Dewalt DCH273P2 do the job? A: No, the two tools have different drill bits. Dewalt DCH273P2 bits are not sufficient to drill the 20″ concrete. They are meant for light drilling. Q: Does the Dewalt DCH273P2 pack have enough room for the long drill bits? A: Yes. There is enough space to accommodate 7″ long bits and 10″ chisels. Q: Can Dewalt DCH273P2 work with a 20V 9.0Ah battery? A: Yes, it can. You just need to ensure that the shape of the battery matches what is in the original picture. Observing the features and pros of using Dewalt DCH273P2, I think that this tool is one of the best rotary hammer drill tools on the market. Its design is very attractive, and its weight is manageable. Moreover, there is a utility hook that comes with the tool. When it comes to performance, the motor is powerful as it delivers up to 2.1 joules of corded power. The battery runs the tool for several hours before its recharged. What else can one want from a cordless rotary hammer? Nothing I believe since the Dewalt DCH273P2 has all you need for light drilling. • Brushless motor: The powerful motor delivers an extended runtime. It’s made up of robust parts, thus durable. • Max batteries (5.0Ah): There are two lithium-ion batteries included in the pack. The battery voltage required to drive the drill is 20V. • Corded power: The rotary hammer drill is designed to give about 2.1 joules of impact coded energy. The power is effective for heavy hammering and drilling. • Utility hook: The tool comes with a retractable hook which ensures that it’s easily hanged and stored away from moisture and dust. • BPM: The blows per minute are up to 4600BMP. This is very effective when drilling holes in light concrete and wood. • Speed: The no-load speed of using this rotary hammer drill is up to 1100 RPM. You can adjust the speed as your work demands. • Dust extractor: This feature allows you to safely collect the dust formed from the drilling. The element helps you work safely, swiftly, and efficiently. • Torque adjustment: There is a factory-set clutch that reduces the sudden bit jams associated with high torque. Dewalt DCH273P2 needs to be cleaned after use and hanged by its hook. The motion parts need to be oiled and the bits sharpened regularly to guarantee the best performance. The carrying case for Dewalt DCH273P2 includes two 5.0 Ah lithium-ion batteries, one DCB charger, one depth road, and one 360-degree side handle. There is also the utility hook for hanging. Who Can Use Dewalt DCH273P2? • Builders: Experts in the building and construction sectors can use the rotary hammer drill to make holes in light concrete and tiles when making pathways for wiring and piping. • Plumbers: The experts can use the tool to make holes for drainage passages. The machine can drill light metal, concrete, and wood surfaces. The tool is effective for the application since its fast and hassle-free. • Electricians: The tool is suited for electrical drilling and hammering applications. It’s stable and averagely light, making it a great electrical tool. • Carpenters: Woodworkers can use the machine in making holes on their craftworks. • Any DIY Expert: If you make crafts at home that require the use of a drill, the Dewalt DCH273P2 is perfect for the job. 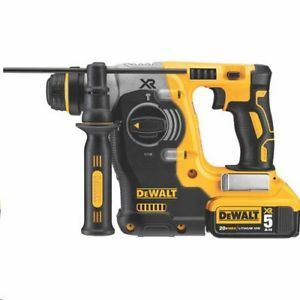 This Dewalt cordless rotary hammer drill review highlights a lot of impressive things about the tool. Nonetheless, there are a few concerns. For example, I have a problem with spending $529 on a rotary hammer drill. There is no doubt about its effectiveness when doing light duties. I would not be having an issue if the tool was suited for heavy concrete and metallic drilling. The other thing that I am not comfortable with is the weight of the machine. 11.6 pounds is a little heavy when working with the Dewalt DCH273P2 for several hours consistently. For short drilling, the weight is okay but if you plan to work for long, the tool may tire you. How Does Dewalt DCH273P2 Compare with Other Comparable Hammer Drills? The biggest difference between the two cordless hammer drills is their weight. Dewalt DCH273P2 is heavier (11.68 pounds) than Milwaukee 2416-20 (3.9 pounds). Nevertheless, Dewalt DCH273P2 is most suited for light drilling while the Milwaukee drill is suited for moderate drilling. The two tools have almost similar working principles. They are both great for light drilling. They also possess the counter-vibration potential. The difference is in their speed and torque power where Dewalt DCH273P2 enjoys more RPM and corded energy. Both tools come with powerful brushless motors and incredible batteries. In terms of voltage, the Dewalt DCH273P2 uses 20V while Bosch RHH181-01 uses 18V. The battery for Dewalt DCH273P2 is rated 5.0Ah while that of Bosch is 4.0Ah. In terms of performance, the two tools are great for light drilling on both wood and concrete. What Do Users say about Dewalt DCH273P2? The three reviews are just a fraction of the reflection that most users have about this best rotary hammer drill. Undoubtedly, it’s a must-buy for all light drilling responsibilities. Putting the few concerns aside, the Dewalt DCH273P2 is an impressive tool for light drilling. It’s suited for chiseling light concrete, tiles, and wood. I recommend Dewalt DCH273P2 to all DIY aficionados and handymen who want a hollowing tool in their toolboxes. The tool will save you significant working time and energy.